Congestion Pricing - similar to tolling roads – is successfully used by London, Singapore and other leading cities to reduce vehicular congestion in the central business district (CBD). Congestion pricing improves air quality and related health issues, it improves quality of life of both drivers and transit users who waste less time in commute, and it helps fund a better transit , thus achieving a virtuous circle. 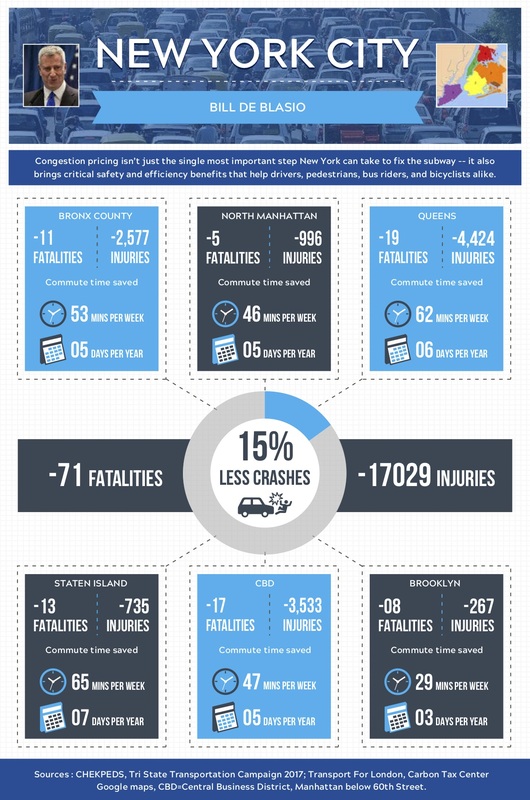 It also significantly reduces crashes and could bring New York city closer to reaching its goal of Vision Zero. The research “Congestion Pricing: Saving Lives, Saving Time” analyzes Congestion Pricing from the windshield perspective. It shows meaningful benefits for commuters who drive to the CBD with reductions in travel time. It highlights the positive impacts of Congestion Pricing on traffic safety and Vision Zero for all street users, and in particular motorists . Download the full report here. The map below illustrate benefits for boroughs and legislative districts. Click on the blue icons to see borough statistics and green icons for selective legislative district statistics. You can download the pictures to use them in your advocacy . New York’s transportation system is failing: subway and trains are falling in disrepair due to lack of funding. Manhattan is so clogged with congestion that buses travel at 4 mph. and the air quality is not meeting the EPA standards, causing respiratory illnesses and developmental issues for children. The less of 5% of workers commuting by car to the CBD are also suffering from congestion with long commute times, stress and missed appointments. Governor Cuomo convened two study groups over the last two years who both concluded that no other source of funding could replace congestion pricing, although they recommended a number of other measures that could ease congestion without raising revenue January 2018 and December 2018.